Newman was born in New York City, the son of Jewish immigrants from Poland. He studied philosophy at the City College of New York and worked in his father's business manufacturing clothing. He later made a living as a teacher, writer, and critic. From the 1930s on he made paintings, said to be in an expressionist style, but eventually destroyed all these works. Newman met art teacher Annalee Greenhouse in 1934; they were married on June 30, 1936. Newman wrote catalogue forewords and reviews and also organized exhibitions before becoming a member of the Uptown Group and having his first solo show at the Betty Parsons Gallery in 1948. Soon after his first exhibition, Newman remarked in one of the Artists' Session at Studio 35: "We are in the process of making the world, to a certain extent, in our own image." Utilizing his writing skills, Newman fought to reinforce his newly established image as an artist and to promote his work. An example is his letter on April 9, 1955, "Letter to Sidney Janis: ... it is true that Rothko talks the fighter. He fights, however, to submit to the philistine world. My struggle against bourgeois society has involved the total rejection of it." Although Newman's paintings appear to be purely abstract, and many of them were originally untitled, the names he later gave them hinted at specific subjects being addressed, often with a Jewish theme. Two paintings from the early 1950s, for example, are called Adam and Eve. There is also Uriel (1954), and Abraham (1949), a very dark painting which, as well as being the name of a biblical patriarch, was also the name of Newman's father, who had died in 1947. The Stations of the Cross series of black and white paintings (1958–1966), begun shortly after Newman had recovered from a heart attack, is usually regarded as the peak of his achievement. The series is subtitled Lema sabachthani - "Why have you forsaken me" - the last words spoken by Jesus on the cross, according to the New Testament. Newman saw these words as having universal significance in his own time. The series has also been seen as a memorial to the victims of the Holocaust. Newman's late works, such as the Who's Afraid of Red, Yellow and Blue series, use vibrant, pure colors, often on very large canvases - Anna's Light (1968), named in memory of his mother who had died in 1965, is his largest work, 28 feet wide by 9 feet tall (8.5 by 2.7 meters). Newman also worked on shaped canvases late in life, with Chartres (1969), for example, being triangular, and returned to sculpture, making a small number of sleek pieces in steel. These later paintings are executed in acrylic paint rather than the oil paint of earlier pieces. Of his sculptures, Broken Obelisk (1963) is the most monumental and best-known, depicting an inverted obelisk whose point balances on the apex of a pyramid. Newman is generally classified as an abstract expressionist on account of his working in New York City in the 1950s, associating with other artists of the group and developing an abstract style which owed little or nothing to European art. However, his rejection of the expressive brushwork employed by other abstract expressionists such as Clyfford Still and Mark Rothko, and his use of hard-edged areas of flat color, can be seen as a precursor to post painterly abstraction and the minimalist works of artists such as Frank Stella. Nine years after Newman's death, his widow Annalee founded the Barnett Newman Foundation. The foundation not only functions as his official estate, but also serves "to encourage the study and understanding of Barnett Newman's life and works." The foundation was instrumental in creating Newman's catalogue raisonné in 2004. The U.S. copyright representative for the Barnett Newman Foundation is the Artists Rights Society. Among the public collections holding works by Barnett Newman are the Addison Gallery of American Art (Andover, Massachusetts), the Allen Memorial Art Museum (Oberlin College, Ohio), the Art Institute of Chicago, the Berlin State Museums, the Cleveland Museum of Art, the Detroit Institute of Art, Harvard University Art Museums, the Hirshhorn Museum and Sculpture Garden (Washington D.C.), the Indianapolis Museum of Art, Kawamura Memorial Museum of Art (Japan), Kunstmuseum Basel (Switzerland), the Los Angeles County Museum of Art, the Menil Collection (Houston, Texas), the Metropolitan Museum of Art, Museo Nacional Centro de Arte Reina Sofía (Madrid), the Museum of Contemporary Art, Los Angeles, the Museum of Modern Art (New York City), the Nasher Sculpture Center (Dallas, Texas), the Nassau County Museum of Art (Roslyn Harbor, New York), the National Gallery of Art (Washington D.C.), the National Gallery of Canada (Ottawa), the San Francisco Museum of Modern Art, the Sheldon Museum of Art (Lincoln, Nebraska), the Smithsonian American Art Museum (Washington D.C.), Stedelijk Museum (Amsterdam), the Tate Gallery (London), the Wadsworth Atheneum (Hartford, Connecticut), the Walker Art Center (Minneapolis, Minnesota), the Wallraf-Richartz-Museum (Cologne, Germany), and the Whitney Museum of American Art (New York City). After Newman had an artistic breakthrough in 1948, he and his wife decided that he should devote all his energy to his art. They lived almost entirely off Annalee Newman's teaching salary until the late 1950s, when Newman's paintings began to sell consistently. Ulysses (1952), a blue-and-black striped painting, sold in 1985 for $1,595,000 at Sotheby's to an American collector who was not identified. Consigned by Microsoft co-founder Paul Allen and previously part of Frederick R. Weisman's collection, Newman's 8.5-by-10-foot Onement VI (1953) was sold for a record $43.8 million at Sotheby's New York in 2013; its sale was ensured by an undisclosed third-party guarantee. This was eclipsed on May 13, 2014 when Black Fire 1 sold for $84.2 million. ^ a b Roberta Smith (May 13, 2000), Annalee Newman, 91, Muse And Support for the Artist The New York Times. ^ John P. O'Neill, ed. (1990). Barnett Newman Selected Writings and Interviews. University of California Press. pp. 240–241. ^ John P. O'Neill, ed. (1990). Barnett Newman Selected Writings and Interviews. University of California Press. p. 201. ^ Menachem Wecker (August 1, 2012). "His Cross To Bear. Barnett Newman Dealt With Suffering in 'Zips'". The Jewish Daily Forward. Retrieved August 8, 2012. 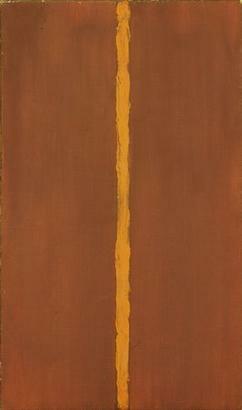 ^ Rita Reif (May 3, 1985), Barnett Newman's 'Ulysses' Sold At Sotheby's Auction The New York Times. ^ Kathryn Tully (2014-05-14). "New Artists Set Auction Records At Christie's Biggest Ever Sale". Forbes. Bruno Eble (2011). Barnett Newman et l'art roman (in French). Paris: L'Harmattan. ISBN 978-2-296-55188-6. Mark Godfrey (2007). Abstraction and the Holocaust. Yale University Press. pp. 51–78. ISBN 978-0-300-12676-1. Wikimedia Commons has media related to Barnett Newman.